(abs, pdf) Mushotzky et al., Do Most Active Galactic Nuclei Live in High Star Formation Nuclear Cusps? 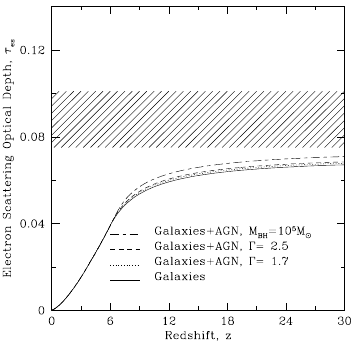 (abs, pdf) Bowler et al., The bright end of the galaxy luminosity function at z ~ 7: before the onset of mass quenching? Reionization is an extended process where the whole universe transitions from neutral to ionized between 300 and 1,000 million years after the Big Bang. While it has been established that galaxies are the main drivers of reionization and that active galactic nuclei (AGN) are unimportant during this process, very few have made an effort to quantify the exact contribution to the reionization history. In our paper, we find that AGN only increases the optical depth to Thomson scattering by ~2% under the most optimal conditions, thus strengthening the need for other sources beyond observed AGN and galaxies to match the observed optical depth by WMAP and Planck. This paper was primarily written by Rachel Grissom, who is a 2nd year graduate student at the CRA, and it is her first paper. Congratulations!